Welcome to UltraDave's Running Stuff page! I've been running since 1976, when I went out for my high school cross-country team. 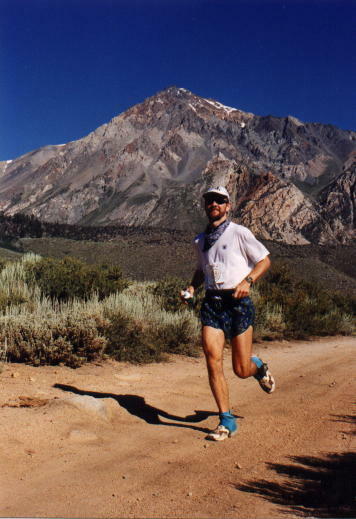 Running and racing certainly has become a way of life for me, I figure in addition to the countless thousands of miles I've logged over the years, I've also competed in over 800+ races of varying distances, ranging from 1 to 100 miles! I stopped keeping track of all of the races long ago, but still have a record of all of the marathons and ultra-marathons I've participated in. Check out the spreadsheet below to see how much fun I've had over the years! Of course, all that running means lots of great memories. Click on the links below to see photos taken throughout my running life. There's also a Cool Running Link that will take you to a page with all kinds of great running-related links. Enjoy! 3 Dawn To Dusk Ultras-12 hour track run Springfield, Pa May-84 51.75 mi. 5 Dawn To Dusk Ultras-12 hour track run Springfield, Pa May-85 52.5 mi. 9 Catalina Island Marathon Catalina Island, Ca. Mar-86 4:08:?? 37 Dawn To Dusk Ultras-12 hour track run Springfield, Pa May-93 70.25 mi. 44 Claremont 12 Hour Track Run Claremont, Ca. 10/23/1993 71.62 mi. 65 Catalina Island Marathon Catalina Island, Ca. 3/18/1995 3:45:? ?